The last time I posted about our chickens, I'd built a separate emergency run for the newbies to hang out in during the day. 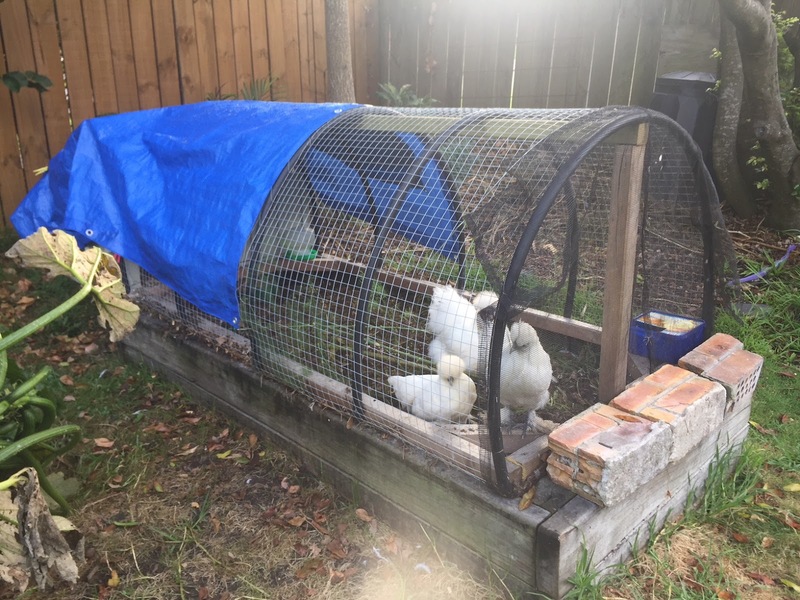 It was to keep them safe from our original chicken, Fluffles, who had turned into a ferocious pecking machine at the sight of the two new invaders. 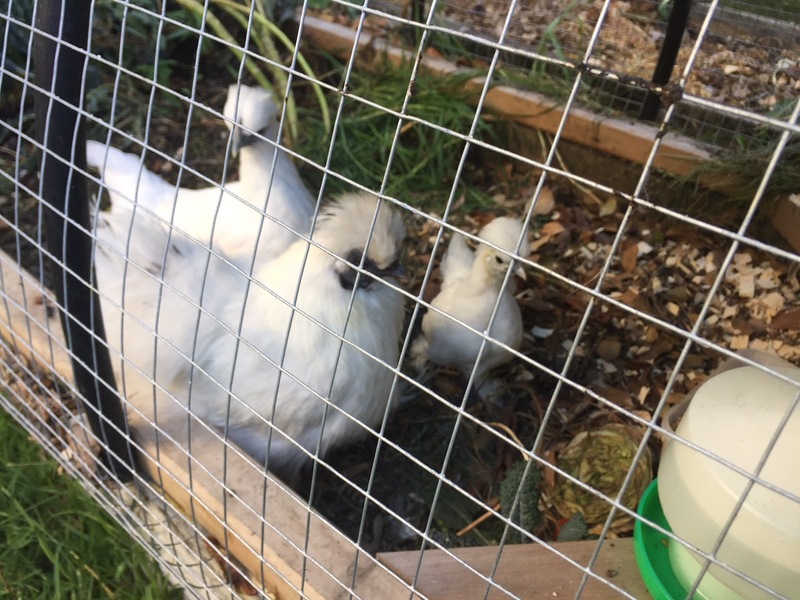 We kept the new chickens separate but side-by-side to Fluffles for a couple of weeks, so she could get used to them visually. 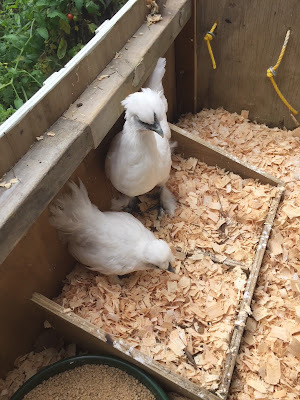 It meant we had to manually shift them into the coop at night and even then, we were putting them in a box inside the coop, so Fluffles wouldn't run them outta town. 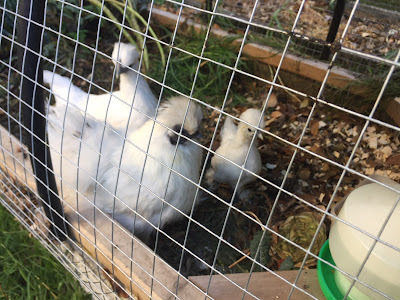 The little chickens didn't much like getting moved about at night, so they started settling down under the BBQ tray in their run area to sleep. 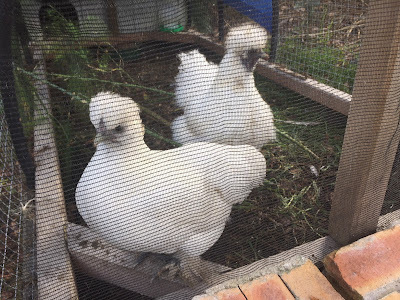 I really wanted them to sleep in the coop with Fluffles, so she'd get used to them and because it was drier in there, so I made the call to reintroduce them to Fluffles' run full-time. 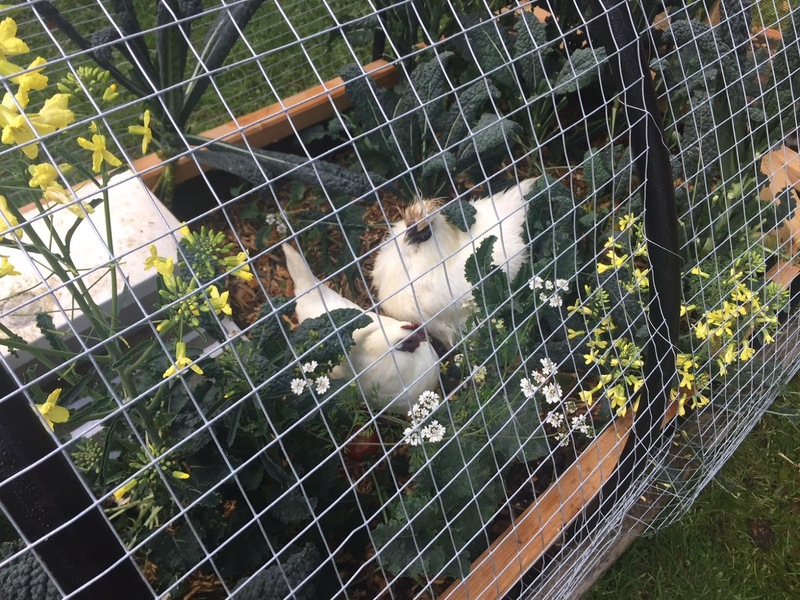 There was a bit of pecking, to be sure, but no blood was drawn and the little chickens got good at running away from Fluffles, using the kale for armour. The littlest chicken, Rosie Posie, also got good at hiding behind/under our medium-sized chicken, Nut Fox. 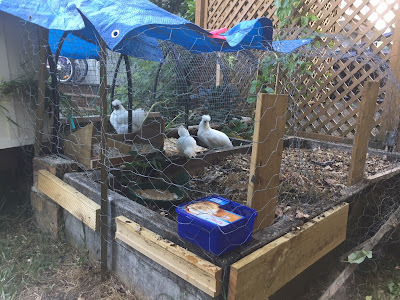 I really wanted to move the whole run area to a new spot, so Fluffles wouldn't feel so territorial, but I needed to wait for our potatoes to be ready to do that. I threw big handfuls of aged grass clippings from the compost bin into the potato garden first, and the chickens went to town looking for bugs in it as soon as they arrived in the new run. Since moving the chickens to the new spot, I've noticed way less pecking by Fluffles. It's such a relief to see the chickens living together in relative harmony. The younger two are definite besties, but Fluffles can hang out with them serenely too, most of the time. 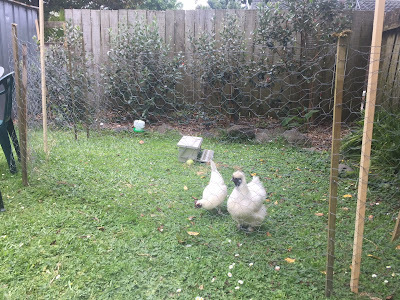 The two gardens we moved the chooks out of were completely cleared out by the chickens. Nut Flox and Rosie Posie even ate all the kale, which Fluffles had never touched. I'm planning to turn over the soil in these gardens, to get the aged soil from the bottom up to the top, ready for planting some tasty autumn crops. Although, for the life of me, I can't think what to plant at this time of year besides spinach and lettuce. 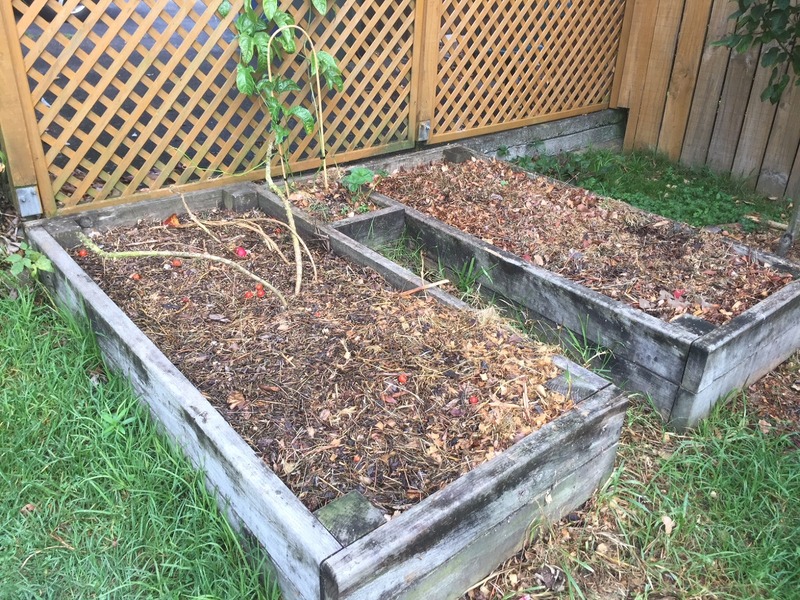 What crops would you recommend I plant (autumn in the southern hemisphere)? 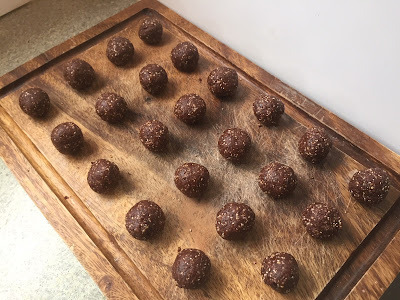 I've been promising you this chocolate bliss ball recipe since I did my What I ate in a day post during the summer holidays. 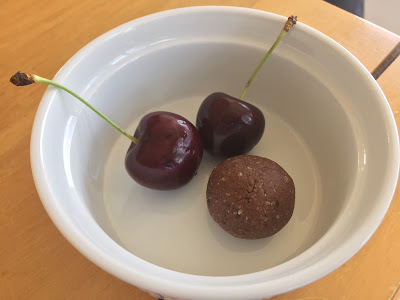 I make a batch of these chocolate bliss balls about once a fortnight, because they're delicious and handy for lunchbox fillers. 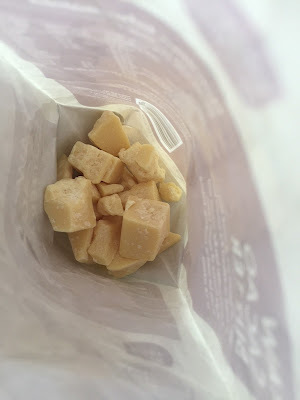 They really hit the sweet spot after a savoury meal, and they're full of nutritious ingredients which make me happy to have the kids eat them. We ate a lot of them when we were exploring Tiritiri Matangi last week, and I was so glad I'd brought them because they gave us the energy boost we needed on the uphill climb. My kids didn't used to like bliss balls overly much, until I developed this recipe. Now they're all in love. 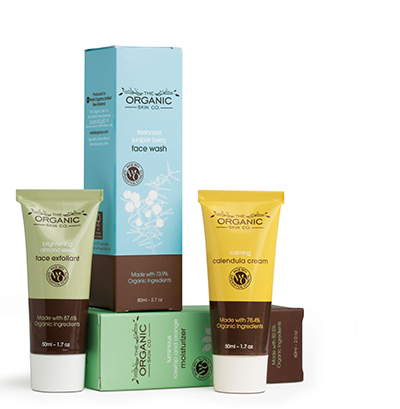 The secret ingredient, which has made all the difference, is cacao/cocoa butter. 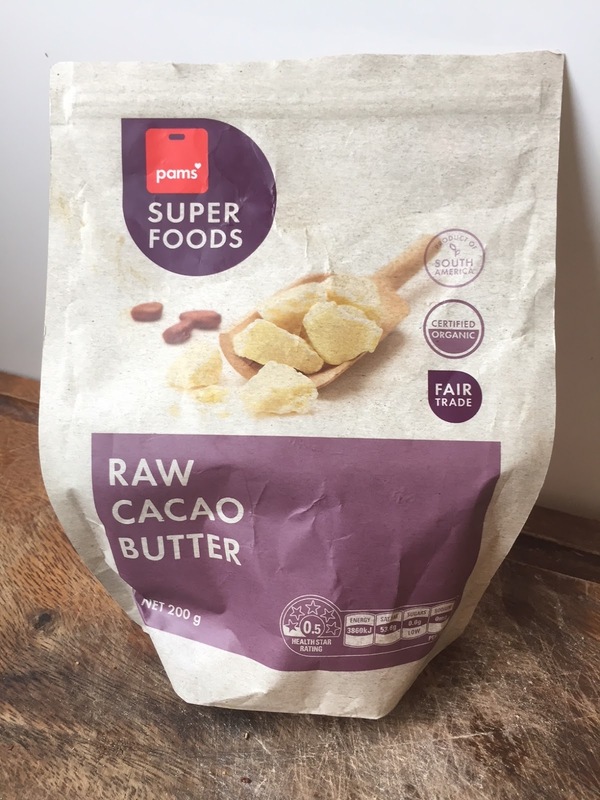 It gives these bliss balls a real chocolatey taste and texture, when mixed with cacao/cocoa powder. I usually eyeball the measurements for this recipe, but for you I've tried to measure them out so that you can recreate it. It's pretty forgiving if you've got a little more of this and a little less of that. Generally speaking, I try to go for equal proportions of dates and nuts, and then just throw in whatever else I want. 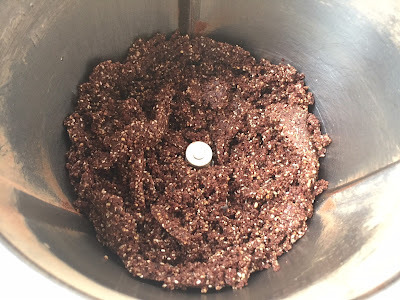 The base recipe below will give you a basic chocolate bliss ball. You can then add in whatever you like of the optional extras to incorporate more nutrients and flavour to the recipe. 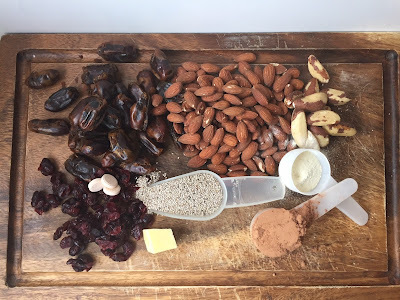 *Brazil nuts have a somewhat dirt-like flavour that can overwhelm the bliss balls, so I usually just add a few of these for their selenium content, but use another nut for the majority. 1. 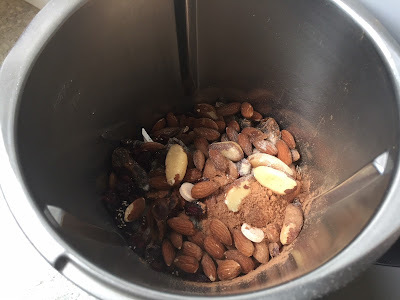 Place all the ingredients in a food processor or high powered blender and blend until a meal-like texture is formed and the nuts have begun to release their oil. 2. 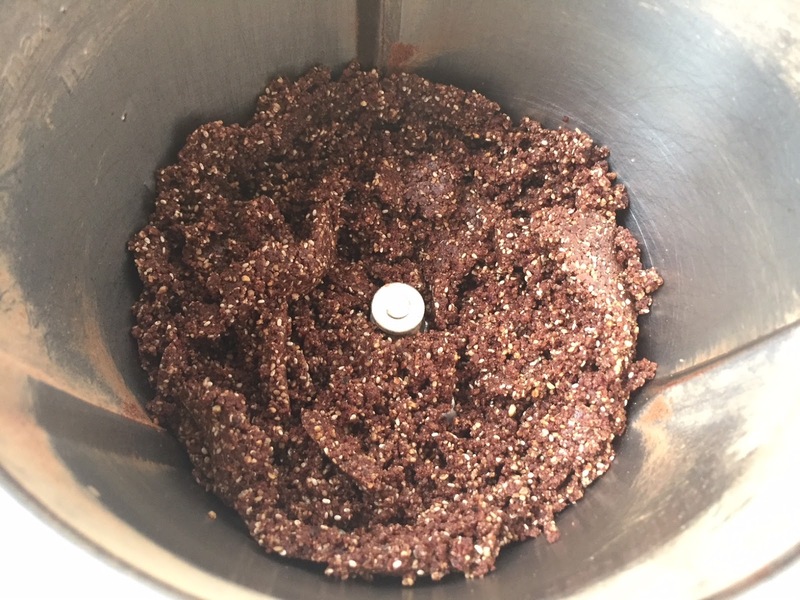 Take a heaped teaspoon of the blended mixture and roll between the palms of your hand to form a ball shape, squeezing together slightly to create a firm ball. 4. Store in an airtight container in the fridge for up to two weeks. If you make this recipe, let me know what ingredients you decide to try and how it turns out for you. Our family lost one of its members over the summer holidays. 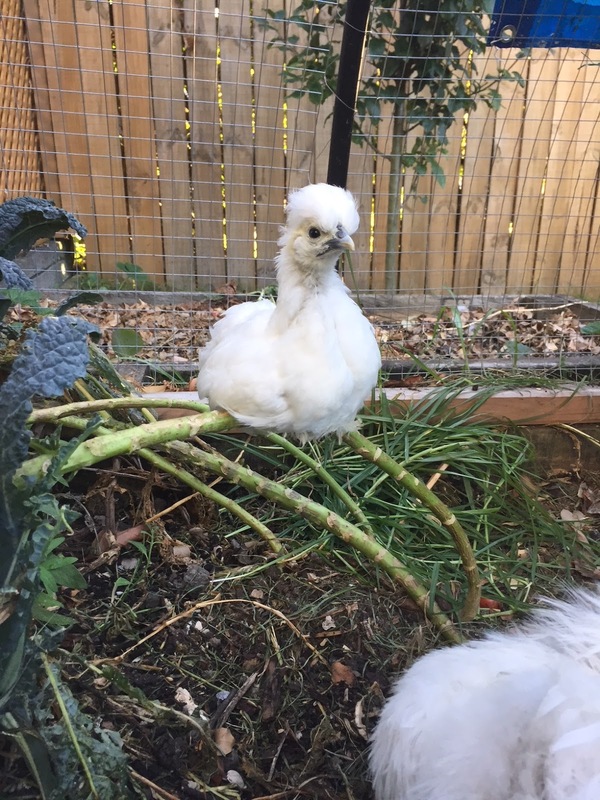 We came home to the sad news that Saffie, our little bantam chicken with the red crown, had flown over the fence and been attacked and killed by an animal. My neighbour had been looking after our animals while we were away, and was very upset to have to break the news. 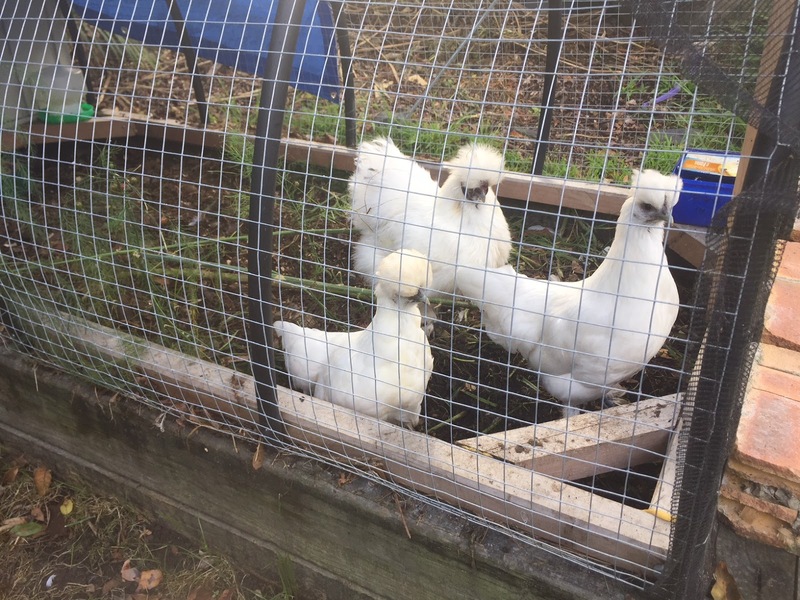 I had put the chickens and their coop in an open run area over the Christmas period. I thought they'd enjoy having more room and trees to play in, since I wouldn't be there to bring them fresh material each day like I do when they're in their enclosed run. So Saffie is no more, and Fluffles has been a lonely little chook without her bestie. She's taken to crowing at dawn to call for her friend (sorry neighbours!). 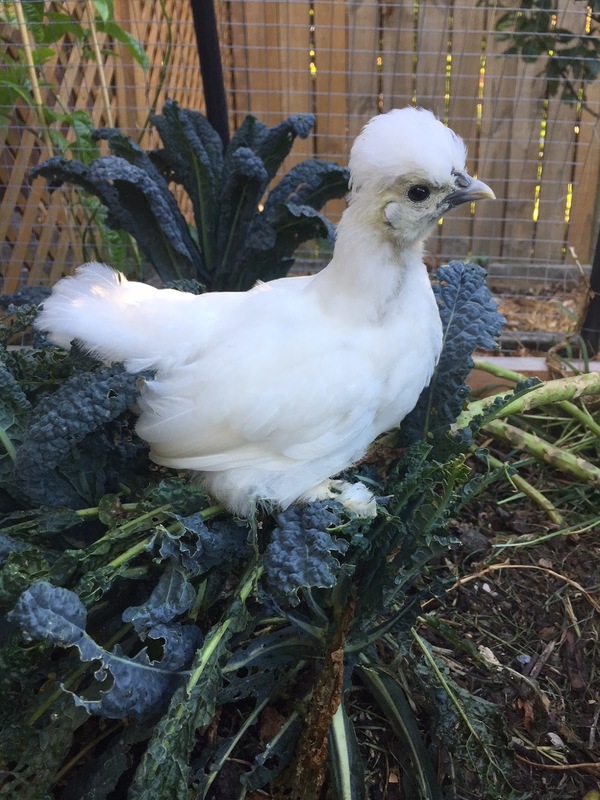 I rang Bird Barn a few weeks ago to ask if they had any silkies for sale, and was told they would have some ready in about four weeks. We bundled our new silkies up in a cardboard box and brought them home to introduce to Fluffles. 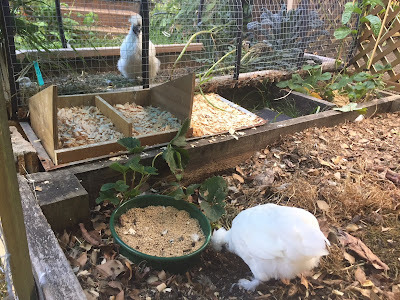 At first we put the silkies into the coop area, which I lined with fresh wood chips to make it smell more neutral for them. They explored around in there for a couple of hours, while Fluffles stayed out in the run area - avoiding them. A couple of times I spotted Fluffles peaking her head into the coop and then backing out again. 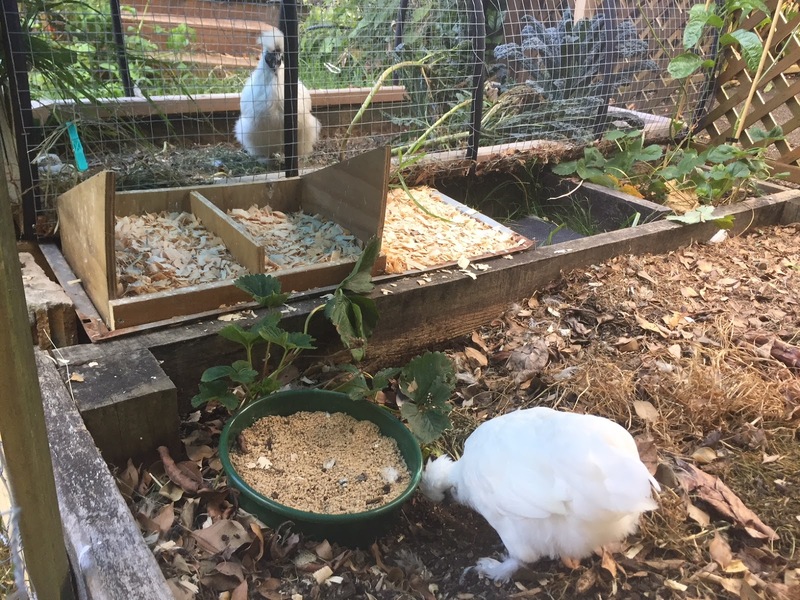 It was only when she got frightened by me watering the garden, that she went right into the coop with them and sat there quietly. Fluffles came back out when I stopped watering, and a little while later the littlest silkie, Rosie Posie, followed her out into the run. The 16-week old silkie, Nut Fox, took a little longer to adventure out, but eventually did too. We sat watching them for a long time, and they were all friendly to each other, cuddling up and exploring the area happily. But then as the evening went on and it was getting time to bed down for the night, Rosie Posie, started to get upset, calling for her brothers and sisters and looking for a way to escape. She even jumped up onto the kale, looking for a way out. This seemed to upset Fluffles, who then became territorial, pecking at Rosie Posie and even Nut Fox when she got too close. The pecking began to escalate in ferocity and I grew concerned. I had L climb into the run to rescue the new chickens and I quickly bundled them back into their travel box (which was fitted with breathing holes) and put that in the coop area so everyone could go to sleep safely for the night. That solved the safety issue temporarily, but how could we keep them safe from Fluffles the next day? 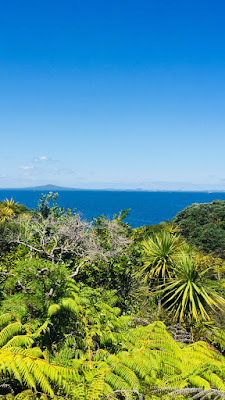 Our family was heading out early in the morning to catch a ferry to Tiritiri Matangi, and would be gone for the whole day. I had visions of Fluffles pecking Rosie Posie to death if I left them all in the same run area unattended. As soon dawn broke and it became light enough to see outside, I was out there unrolling chicken wire and cobbling together a makeshift run area next to the existing one. 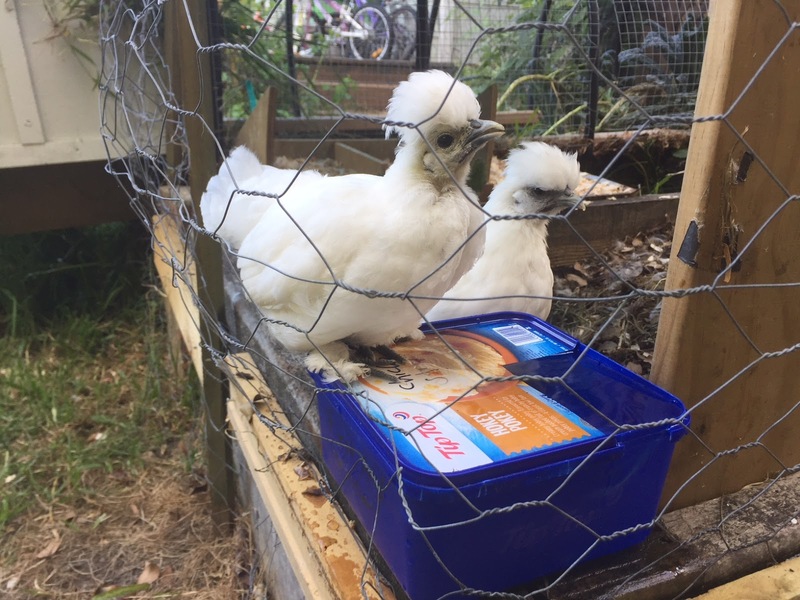 I had read online (in a mad feverish research panic) that it's good to have new chickens in sight of the existing flock, so they can get used to each other visually before trying to assimilate them physically into the flock. It took about an hour and a half to get the new run enclosed. I was deeply grateful to Paul for getting the kids all ready for our day-trip inside while I hammered and assembled. We would have missed our ferry for sure without his help. Because there's a gap between the two raised beds that the runs sit on, I had to block the end of the gap off with bricks. I then used an old BBQ tray to bridge most of the gap, and covered it with the nesting box from inside the coop, so the chickens would have somewhere off the dirt to snuggle down during the day for rests. They can even go underneath the bridge into a little patch of grass if they want to. I put a footstool in the gap to act like a step for them down to the grassy area. 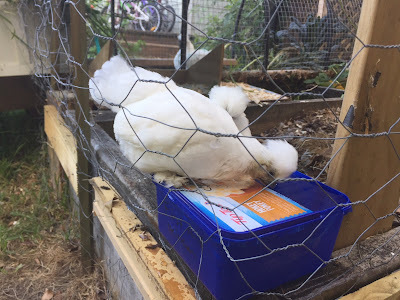 I only had the one waterer, because I hadn't been anticipating separating the new silkies, so I quickly made another one out of an ice cream container. 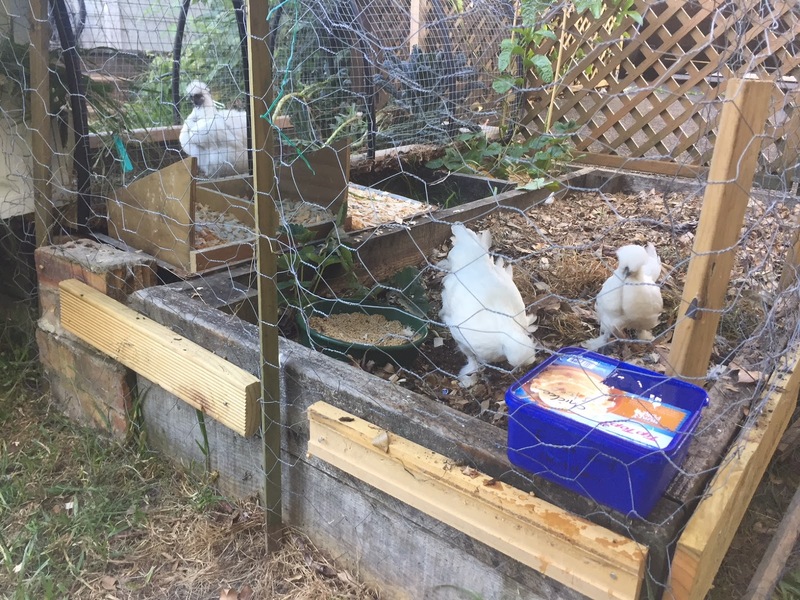 I just cut a corner off the lid to make a gap for the chickens to drink from, while the remaining part of the lid protects most of the water from dirt and evaporation. Even then, they were just pecking water drops off the lid at first, until Rosie Posie accidentally discovered the proper water gap by falling in a little bit. It was a happy accident because now she and Nut Fox are drinking from it like pros. My plan from here is to keep putting the new chooks into the coop with Fluffles at night, separated by the cardboard box. After a week of letting them get used to each other in the side-by-side runs during the day, I'll try moving them all to a new neutral run area on one of the other raised beds. I just have to dig up my potatoes first, so I'll have a space to move them to. If you've had experience introducing new chickens to a flock (or to a single, older chicken like in my case), please share your wisdom. 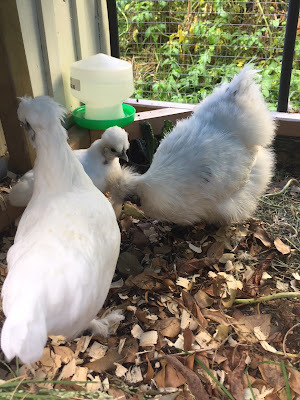 I realise a little bit of pecking does happen as they determine the pecking order, but Fluffles is so much bigger than the other two, she could do real damage if we're not careful about this. The new chooks are so adorable. They get super excited when I come to visit them, and come right up to me, chattering away. I don't want anything bad to happen to them. 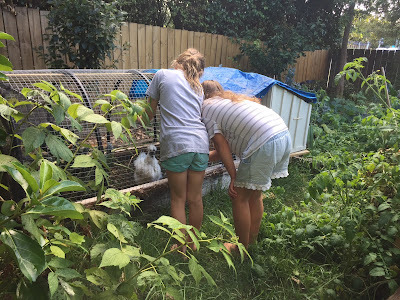 In my last post about our homeschool schedule this term, I mentioned we're working on getting the kids to do more chores around the house. To date, they've been vaguely helpful when it comes to chores. They'll give it a go tidying up the Lego, or packing away board games or cleaning their rooms when asked, but no one is volunteering to do any cleaning around here. Last year I started the kids on the regular job of putting their own washing away each day. That's been going really well and is a huge help to me. I usually bring a load of washing off the line in the late afternoon and dump it on my bed. Then I call all the kids up to find their own washing in the mix and put it away. It doesn't take long and it means the washing gets cleared every day. 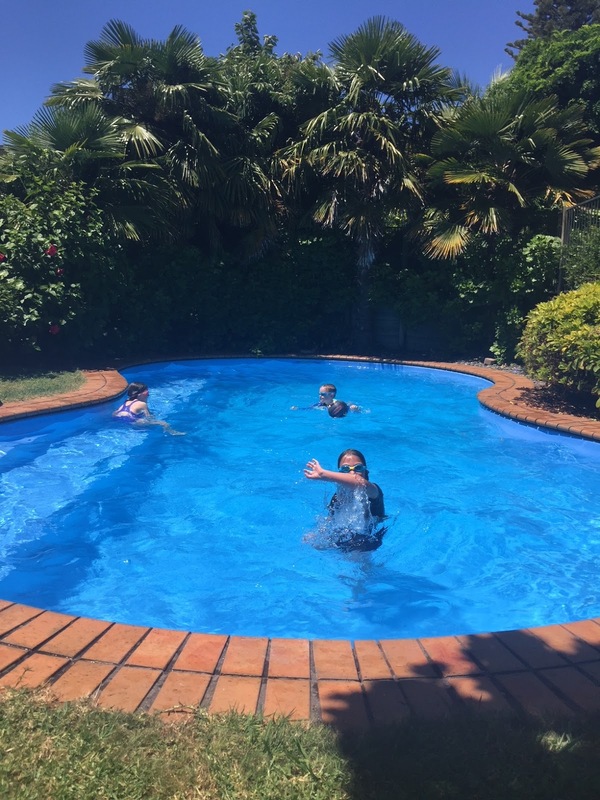 However, I realised the kids could be doing a whole lot more when, over the holidays, I stayed at my sister-in-law Kim's house in Te Puke and saw what her kids are capable of. 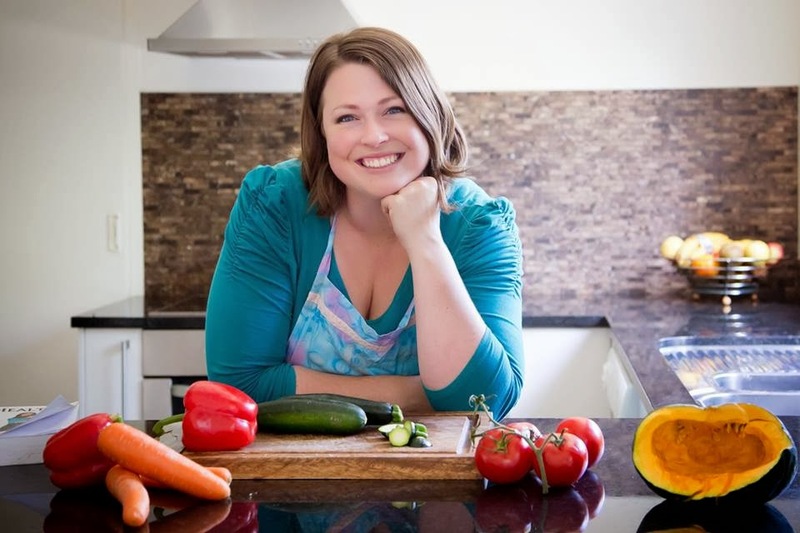 Admittedly, her children are older than mine, but the reason they're able to do what they do is because she and her husband have trained their kids up, and put a system in place to enable success. I was so impressed with their chore system, I decided to steal it. In a nutshell, this is how their system works: Each kid is completely in charge of one chore for one week. 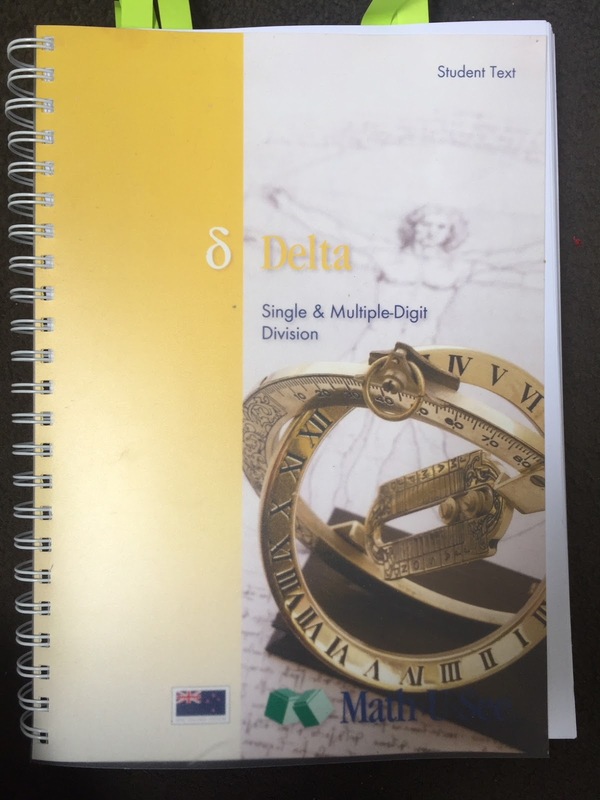 The following week, all the kids rotate to a new task. I like the system because there's a fairness to it. If you don't like the job you're on this week, don't worry, someone else will be hating it just as passionately next week. The list of jobs my sister-in-law was using didn't work for our context, because my kids are younger/shorter and I have less of them. So I came up with my own list that I thought would be super helpful for us here. We started it this week and it's been going fairly well. We have two toilets, so the kid on this job cleans the downstairs toilet the first day, and then the upstairs toilet the next day. They then continue to alternate between the two toilets for the rest of the week except for Sunday, which they get to have off. It means both toilets get cleaned three times a week, and always stay nice and fresh. It also means the job never gets too difficult, because the toilet is always in a pretty good state for them. To clean the toilet, they scrub the bowl first, and then spray down all the seats and lids and things and wipe them down with toilet paper. 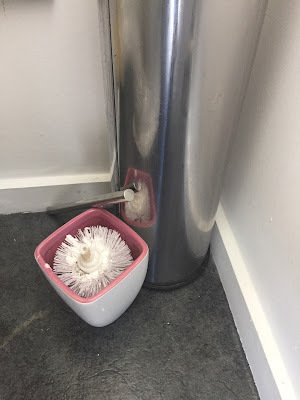 They also spray and wipe the lid of the rubbish bin next to the toilet. Once a week, they do a really thorough job, which includes cleaning the base of the toilet and around the back where the pipe is. We don't have a dishwasher so this job involves helping an adult, either by washing or drying the dishes and putting them away. It happens a couple of times a day, every day, but the kid on this chore gets to do it with an adult, which helps offset the pain somewhat. We only have one bathroom, so I've split that job into three parts. On one day, the kid in charge will clean the bath. On another day, he/she will clean the shower. 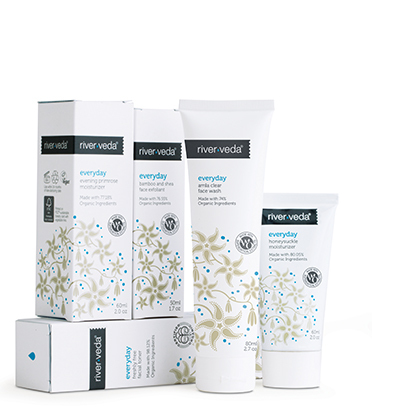 On the third day, he/she will clean the vanity. I'm tossing up whether or not they should also mop the floor on a fourth day. The jury is still out on that one. If the kid so chooses, they can clean all three items in the same day and then have the rest of the week off. Some kids might be motivated to do that to get it out of the way. 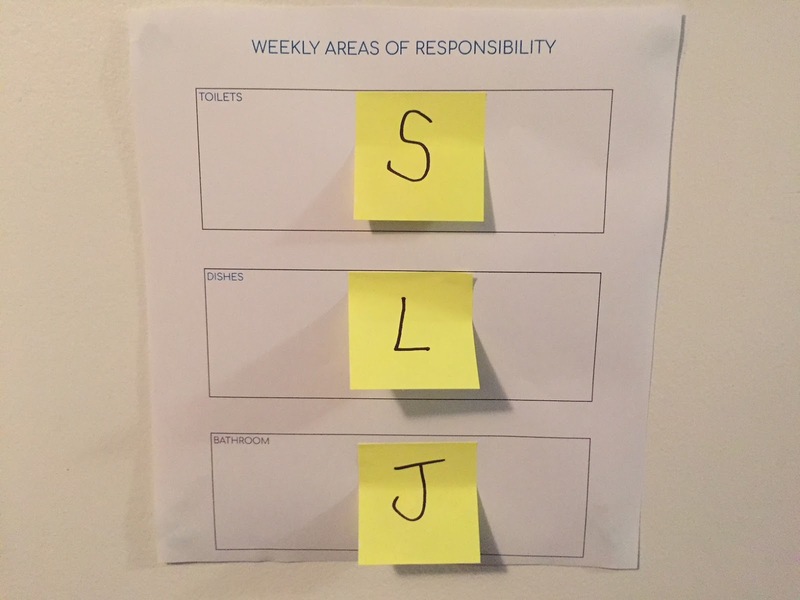 Here's another look at our super simple chore chart. I typed it up, printed it off and stuck the initial of each kid onto their chore for that week with a small post-it note. Every Monday I'll switch the post-it notes around so each kid gets a new chore for that week. We won't pay them for doing these jobs, as such, but for a while now we've been giving the kids $2 a week pocket money, which we keep track of through the Rooster Money app. 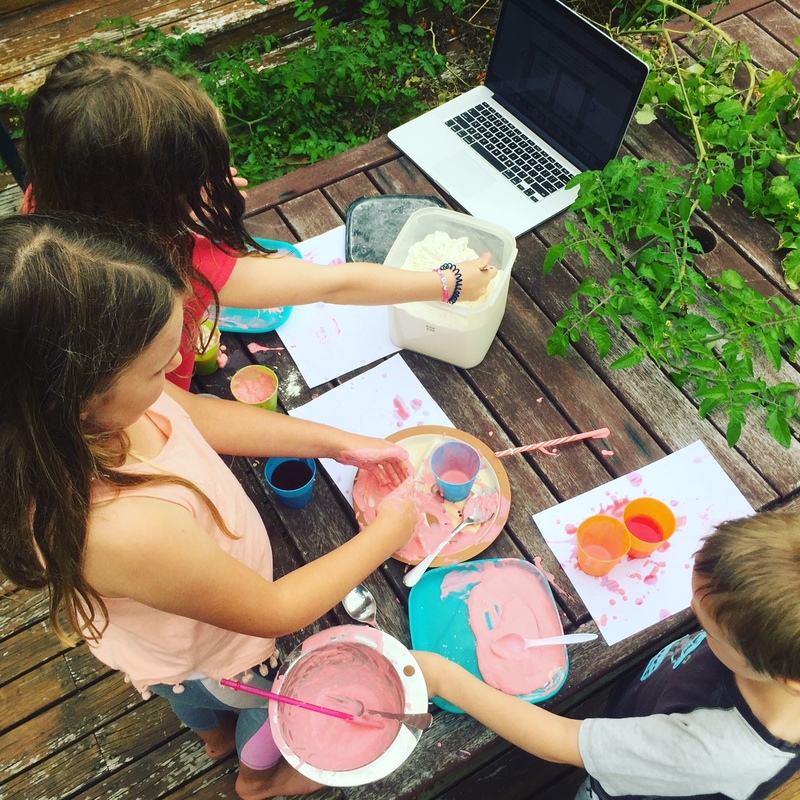 The kids know they don't get their pocket money if they haven't met their responsibilities for the week, ie. put their clothes away, so that system will just continue with the new chores. So far the chores have been going really well. The kids have been doing them willingly and doing a good job. The main thing now is for me to keep ensuring that happens. It's easy to be motivated about a routine when it first starts, but then drop it when it gets old. But I know that if I keep training the kids and insisting they do their jobs, they will. They'll get better at them too. The kid on toilets this week snapped the handle off the upstairs toilet brush in her vigorous cleaning efforts. The same kid also used most of a bottle of toilet cleaner. The same kid also forgot to wipe down the toilet seat after cleaning this morning, so the next person to use the toilet had a surprising sticky welcome for their bum. And that's how it goes with kids. What's your tried-and-true chore system for kids? Does such a thing even exist? After a spectacularly long and glorious summer holiday, homeschool officially resumed for our family this week. 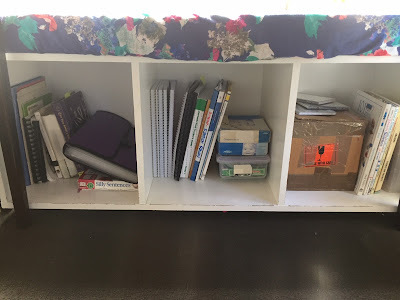 Fortunately I had dedicated one day in the holidays to sorting out our homeschool space and resources, so we were able to glide into the new week fairly easily. 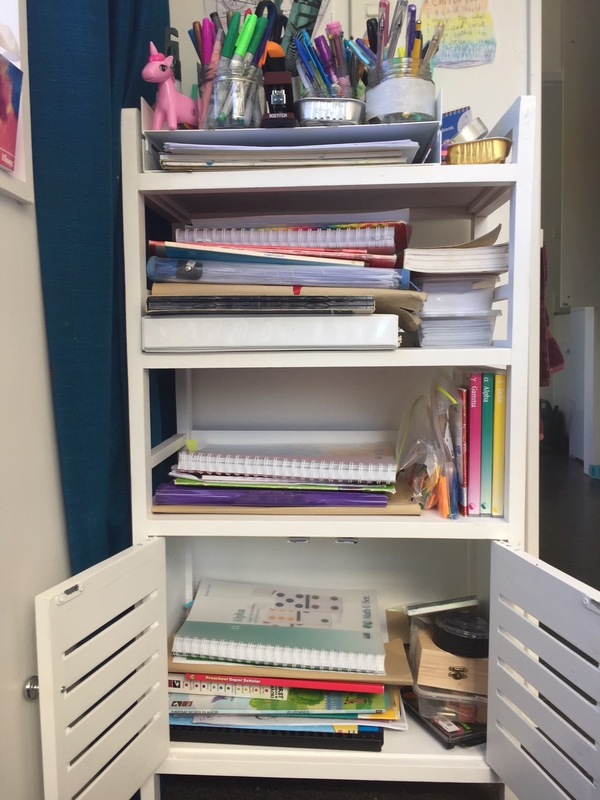 The kids also have their own everyday workbooks in the shelves I bought last year. L's work is under the stationary shelf, S's work is in the next shelf down, and J's work is at the bottom. 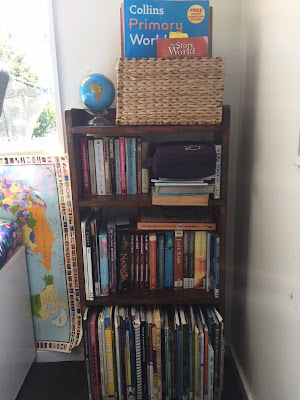 And then there's the skinny bookshelf I fitted in to the right of our bench seating. Our looping basket and globe sit on the top for easy access. The other shelves hold bibles, dictionaries, art technique books, read aloud books and non-fiction books we might use for future topic studies. We also inherited a world map from my sister-in-law recently, and we've been able to pull that out several times to refer to in different subjects. It's so handy. The girls are continuing their music lessons. L is doing Suzuki violin and S is doing piano lessons. For L's violin lessons, she does a half-hour private lesson each week, and then a 45-minute group lesson each fortnight on top of that. The group lessons started up in the last term of 2018, and they were a great way for L to practise playing with other violinists. She was encouraged by how much further she had come along than the newbie, but also motivated to get as good as the more experienced player in her group. 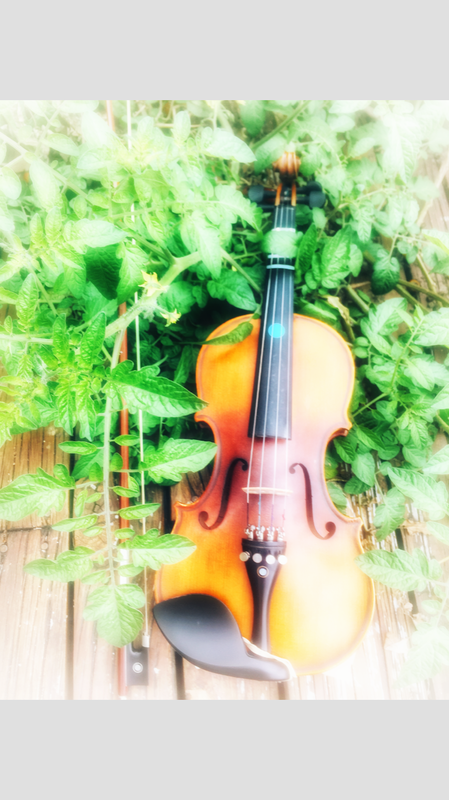 L's violin teacher continues to work wonders. S has a half-hour piano lesson each week during school hours. 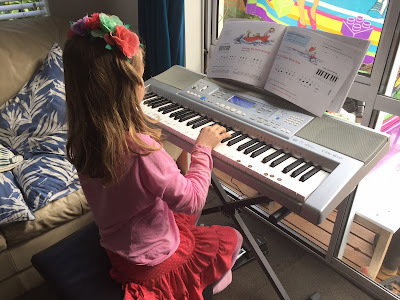 S's piano teacher is absolutely wonderful with her - so funny and cheerful, while still managing to keep Sophie on track. S performed in her first piano recital at the end of last year and did beautifully. She played We Three Kings. In our Christian homeschool group this term, the focus is on athletics. We've got the use of an athletics field with running tracks, long jump, high jump, discus and shotput spaces so the kids are getting a try at all the field events as well as running. One of our homeschool dads is even an ex-Olympics sprint runner, so he has great tips to share with the kids (and they love challenging him to running races). We also have a couple of excursions with that group this term. The first is to Tiritiri Matangi - the bird sanctuary island. I'm so excited about this trip as I've always wanted to go there. We'll be catching the ferry across, which will be a new experience for the kids. 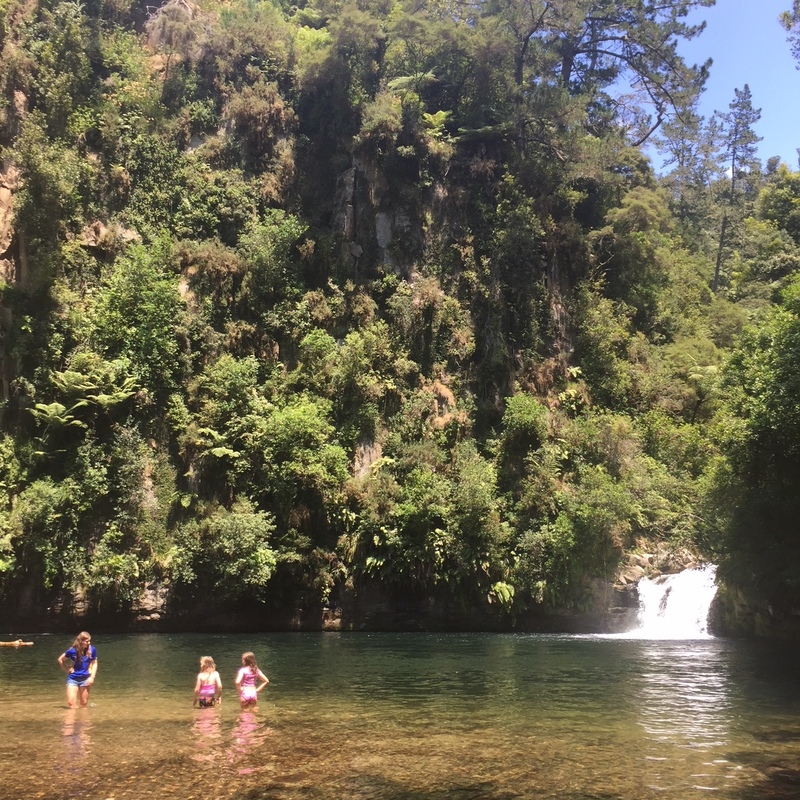 (Not Mokoroa Falls.) This is another beautiful waterfall we visited this summer. The second trip is a bush walk to Mokoroa Falls - another place we've never been to. In our other homeschool group, the kids have signed up for so many activities, I'm having trouble keeping them all straight. I think L is doing Dance Jazz, Visual Art and Photography Skills; S is doing Dance Jazz, Brain Play Computer Programming and Jewellery Making; and J is doing a nature science class, Art Play and Fit Kids. We're not doing official swimming lessons this term, but the kids had so much swim time over the summer in their cousins' pool and at the beach, they've all come a long way anyway. The girls are really confident in deep water and surf (they've learned to dive under big waves), and J can swim in pool water above his head for a short while to get himself to safety, although he still lifts his head straight up instead of to the side to breathe when doing front crawl. We'll likely just head to the swimming pool as we can fit it in this term to keep up their practise. The girls will be going to netball trials next month with the same club they played with last year. It would be brilliant if we could wrangle them into the same team again, but I'm not holding my breath. The subjects and curriculum we're using are pretty much all the same as last term: Math u See for maths; The Good and the Beautiful for reading/writing/grammar/spelling/art appreciation and geography; Story of the World for history; copywork every day for patterning proper writing; and cursive and handwriting practise. I'm hoping to add in science experiments once a week. I've managed to collect quite a bit of science equipment and books from other homeschooling families, so we'll see how we go. We listen to audiobooks most of the time we're driving in the car, to keep patterning that good grammar and vocabulary. Over the holidays we listened to Charlie and the Chocolate Factory twice. We also listened to some of Harry Potter and the Prisoner of Azkaban (until I couldn't put up with the depressing narrator's voice any longer), and we've almost finished the wonderful book The Wednesday Wars. My eldest daughter has also started listening to audiobooks when she runs out of reading material. I check my audiobooks out on the Overdrive app and my daughter uses the Libby app, so it's really quick and easy to find whose is whose. I don't mess with hers, she doesn't mess with mine. I would love to read aloud chapter books to the kids myself more, but my voice gets tired easily as I have a bit of damage to my voice box (officially vocal cord paresis) from a bad cold a couple of years back, so that makes it too difficult. It's wonderful having so many audiobooks available through the library now, although some of them have waiting lists that are a year long at least. 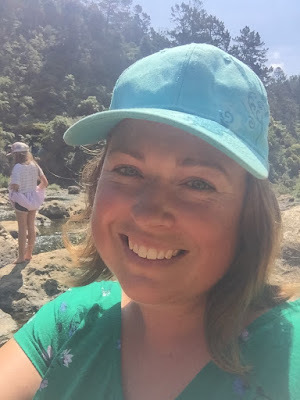 This term I'm also getting the kids more involved with cooking and chores, but this post is already miles too long, so I'll share more about that in another post. And now it's your turn to share. What's new for you in 2019?